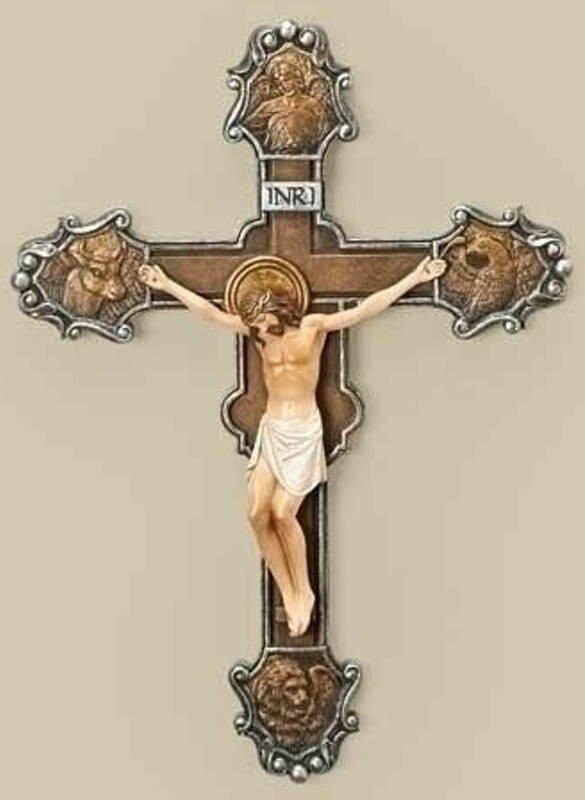 Why Do Catholics Use Crucifixes Instead Of Plain Crosses? Catholics are often questioned why they wear and hang crucifixes, which are crosses to which a “corpus” or the Body of Christ is attached, versus just wearing and adorning themselves, their rosaries, their homes and their churches with “plain crosses”. I had a Protestant Christian friend once ask me in a church something to the effect of, “Why is Jesus still up there on that cross? He has risen from the dead.” The answer really, is quite simple, overwhelmingly powerful, and touching, yet quite to the point: Catholics embrace crucifixes as an intensely visible reminder that Christ Jesus suffered, died, and rose again for each one of us, every single individual human soul of the human race that ever was, is, or will be, and knew us all more than we know ourselves. It is the crucifix, not an unadorned cross, which most vividly underscores this fact. Isn’t it true that when you see an empty cross, your mind automatically “sees” Christ there? After all, we recognize that the cross only has meaning because Christ died on it for our salvation. Catholics use crucifixes to avoid what St. Paul warned about, that the cross be “emptied of its power” (1 Cor 1:17). Christ’s supreme act was to die on the cross as atonement for our sins. His resurrection was proof that what He did on the cross worked—He conquered death—and it demonstrated beyond any doubt that He was who He claimed to be: God. The crucifixion was the act that changed history. The resurrection demonstrated the efficacy of that act. By His death on the cross, Christ conquered sin and death, redeemed the world, opened the way of salvation for all who would receive it, and reconciled His people with the Father (cf. Eph 2:13-18; Col 1:19-20). That is why the crucifix is such a potent reminder for us of what He did on our behalf that dark afternoon on Calvary. “Jesus told His disciples, ‘If any man would come after me, let him deny himself and take up his cross and follow me’” (Mt 16:24; cf. Mt 10:38). True, resurrection and glory await all those who follow Christ faithfully, but we will only arrive there by traveling the way of the cross. And lest anyone imagine that the early Christians did not focus their minds on Christ’s death on the cross, consider what St. Paul says in 1 Corinthians 11:26, where he again emphasizes the crucifixion: “For as often as you eat this Bread and drink this Cup, you proclaim the Lord’s death till He comes.” Recall the scene of the crucifixion. Some in the crowd that was present at Calvary shouted at Christ as He was dying: “Come down off your cross!” (cf. Mt 27:40; Mk 15:30). What a strange and sad echo those words sometimes find today in the arguments of those who object to the crucifix as a reminder of Christ’s sacrifice. We Catholics should strive to emulate St. Paul’s words to “know nothing among you except Jesus Christ and Him crucified” (1 Cor 2:2; cf. 1 Cor 1:17-18).